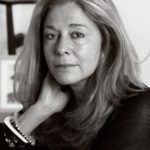 Jorie Graham is the author of numerous collections of poetry, including From the New World: Poems 1976-2014, PLACE, which won the Forward Prize in 2012, and The Dream of the Unified Field: Selected Poems 1974-1994, winner of the 1996 Pulitzer prize for Poetry. Her other poetry collections include Fast, Sea Change, Overlord, Never, Swarm, The Errancy, Materialism, Region of Unlikeness, The End of Beauty, Erosion, and Hybrids of Plants and Ghosts. She served as a Chancellor of the Academy of American Poets from 1997 to 2003 and has also edited two anthologies, Earth Took of Earth: 100 Great Poems of the English Language and Best American Poetry (1990). She is the Boylston Professor of Rhetoric and Oratory at Harvard University.